In celebration of National Bird Day 2016, Barry Kent MacKay, Senior Program Associate for Born Free USA and lifelong bird enthusiast, is writing a special five-part blog series. Below is the fourth installment. Allow me to say to you again that "cute" bird videos that people so often send to me irritate me in many ways-not because I don't like birds, but because I do... passionately. The bottom line is that animals are not toys, they are not playthings, and they do not exist to amuse us with their "antics." What is deemed "cute" or "funny" is often actually a corrupted form of sexual or antagonistic frustration. In these videos, we often see cats or dogs seeming to peacefully, even mischievously, interact with budgies, cockatiels, or other birds. But, what we don't typically see are the sad results of what happens when the cat swats or the dog bites. We don't notice the mutilated wings that render the birds forever flightless, and we seldom see the self-mutilated birds who have frustratingly plucked every feather from their bodies within reach. It greatly saddens me to see such great beauty and dignity so debased as a by-product of our hubristic attitudes toward animals. Above all, these videos present an idealistic-and unrealistic-sense of what it's like to keep birds as pets (even large, difficult-to-keep species, such as macaws). 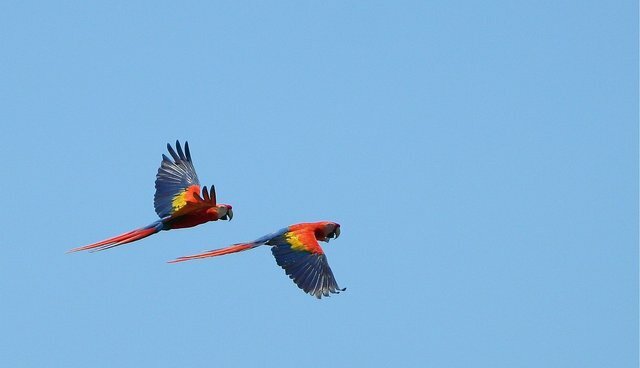 There are some 17 living species of macaws, one of which is extinct in the wild, plus several other extinct species. One of the largest and best known is the scarlet macaw, weighing up to nearly 1,500 grams, or just over three pounds, but looking heavier. Like all of the larger parrots, they can be noisy, destructive, psychotic, and hostile toward some people, with powerful beaks and jaws strong enough to crack Brazil nuts. Zoos and rescue centers are constantly besieged with requests to take macaws and similar birds, once the novelty of owning them wears off and the reality sets in about how challenging they are to maintain. As much as I hate seeing them imprisoned as "pets," whether doing silly tricks or hunched on a T-bar or behind bars, I love seeing them flying low over the tops of the towering forests of their steaming homelands. They range, in disjunct populations, from southern Mexico south as far as Bolivia. As BirdLife International says, they are found "largely in humanterra firme lowland evergreen forest and gallery woodland in savannahs, often in the exposed river banks and clearings with big trees and sometimes entering drier formations..."
They move many miles, as changing conditions provide food sources in various locations over a wide range. The seeds they naturally eat include Jacaranda, velvet tamarind, Sclerlobium, Brazilian copal, souari trees,Licaria, the rubber tree, South American mahogany, Piptadenia legumes, açaí palm, Cedrela mahogany, Hura, Terminalia, Eschweilera, and popcorn tree, plus the pulp and fruit of an even greater range of plants, most lacking familiar English names. They also eat fruit seeds and bark of other plant species, little or none of which winds up in commercial parrot food. They evolved, in short, in an almost infinitely complex, multi-layered, and exorbitantly diverse environment-and we imprison them at their peril, and add the insult of laughing at them. They may look "happy," but the "fun" is ours... at their expense.